Last March, I put up a piece about the Bishopthorpe Brass Band which was formed in the 19th century by Thomas Carbert. We are fortunate that one of Thomas’s great grandchildren, Roxie Wellman of the USA, responded with photographs and further information on the Carbert family. Thomas married three times in Bishopthorpe and had 21 children between his wives: Margaret Stead, Elizabeth Barron and Mary Buckle. Thomas and his last wife, Mary Buckle, had nine children, four of whom left these shores to make new lives in North America. One of these children, Arthur Carbert, was Roxie’s grandfather, seen here playing the tuba in 1936. Arthur was born in the village on 17th November 1870. In 1887, at the age of 17, Arthur borrowed some money, left his remaining family in Bishopthorpe, and worked his passage to America on the ship, Peruvian. He made his way to where his brother Herbert lived in Ontario, Canada, and worked in the area for a year and a half. Moving to Delhi, Minnesota, with his cousin Emmanuel Carbert, he worked on a number of farms. Arthur eventually bought his own farm and married Stella Salome Bruner on 27 October 1898. The couple had eight children: four sons and four daughters. Arthur died in 1961 at the grand age of 91and was buried in Redwood Falls Cemetery, Minnesota. 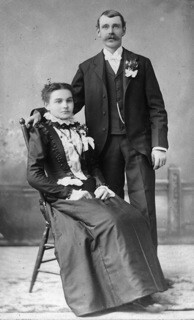 Arthur Carbert married Stella Salome Bruner in 1898. Arthur Carbert is remembered in his family as having a wonderful singing voice. 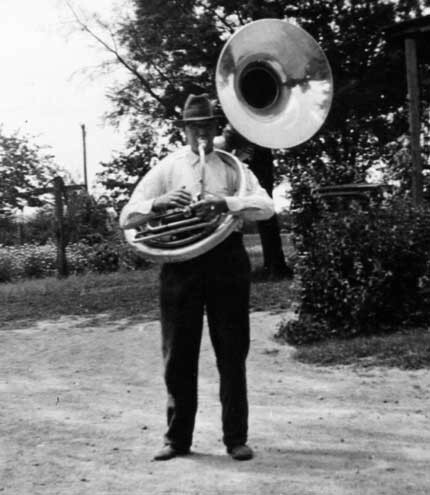 He sang in the Presbyterian Church choir, sang solos – and, obviously, played the tuba. Apparently, it was family lore that Arthur had played in a band in Bishopthorpe. However, they did not know how true this was until Roxie read the article on our website. We see so many villagers passing through time in the historical records of Bishopthorpe; sometimes they live here for many years, others just months. It’s great to learn what happened to some of them. In this way, former residents cease to be just names on a page. With thanks to Roxie Wellman for the photographs and family information.